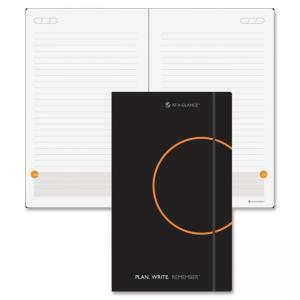 Mead At-A-Glance Lined with Date Box Planning Notebook - Daily - 5\"
Undated planning notebook helps you to plan, write and remember so you have an effective vehicle for your ideas and plans. Undated format lets you start at any time of the year. Perfect-bound, soft, simulated leather cover with bungee closure protects more than 130 ruled planning pages. You can store loose paper in the gusset pocket. One-page-per-day format includes a date box, ruled planning space for most of the page, and a Hot-spot reminder section near the bottom for quick reference. Planning notebook also offers a ribbon page marker to easily locate your page, three-year reference calendar, calendar overview section and bonus information pages including index, contact and event-planning pages.